To celebrate my 30th birthday this weekend, my wife and I took a trip up to the Parker River National Wildlife Refuge on Plum Island so that I could hopefully find some shorebirds to photograph. I did manage to get myself pretty well-soaked in the cold, wet sand, but the real highlight was photographing this barred owl on the drive out of the park. It was a bit like being in Yellowstone, as we could see a cluster of cars pulled off the road and a slew of tripods all set up with their lenses pointed in one direction. I considered just driving by slowly to see what was there instead of joining the crowd, but I'm glad that my wife convinced me to stop and pull out my gear. The sun had nearly fully set, so I had to up the ISO to 3200 to try to get a sharp shot, but it was a real delight to spend a few minutes photographing this gorgeous bird. A wonderful birthday surprise for sure! View more owl photos in my Birds of Prey Gallery. What a beautiful animal! It's a shame that you had to push the ISO so far, but it's a great shot none-the-less. i love these birds. happy 30th to you! That owl is really majestic looking. What a great finish to your day out. Such a nice gift on your birthday! Awesome shot of the owl! As people have said, thats a nice birthday present. Low light shots are always hard - I'm not sure that the "grain" as any impact on this picture. Wonderful shot of the owl and Happy Birthday Pat! Beautiful close up!! Boom & Gary of the Vermilon River, Canada. 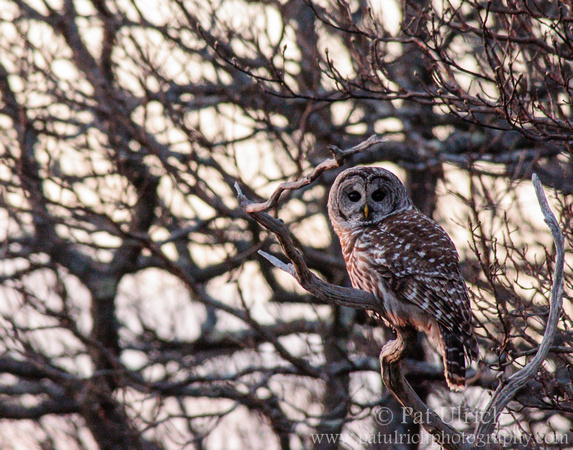 Barred Owls and Great Gray Owls, are my faves, and these images are really strikingly wonderful!